Scroll down page to see what we have AVAILABLE!!! Folks Please Don’t Ask Me to HOLD a Puppy If You Have NO Intentions of Sending a Deposit . We No Longer Offer flying my puppies with Puppy Lap Nannies. Folks are Welcome to fly into Tri Cities Regional Airport (TRI ) and I would be happy to meet you there with your puppy . There is a $50. Per week fee for puppies not picked up at 9 wks UNLESS I have said they aren’t Ready to go to their new home. Please No Calls Before 9 am or After 9 pm . Our Prices are FIRM ! Maltese : $1500. & $1800. Red Poodles $1500. Other colors of poodles $1000.& $1200. This little gal was born 7/14/2018 and is too small for my breeding program. Her current weight is 3 lbs 5 oz. 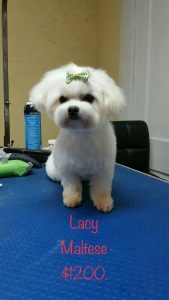 She is a very friendly Maltese and is good with other dogs and children. My Price is a Firm $1200. Gretchen & Loki Toy Poodle Babies DOB: 4/3/2019 Ready 6/5/2019 $1200. For Deposits I ONLY accept Apple Pay , Zelle and Bank Cashier Checks made payable to Cindy Barrett . I also have my Puppy account at BB&T Bank if you wish to make or transfer your deposit into it. For Wires to my account there is additional $15.00 fee. Remember once you commit to a puppy you have 3 business days to get your deposit to me . So if mailing a cashier check I recommend you mail it Priority Mail. Our Adults are Registered with either AKC , CKC or Both We Do Not register any puppies unless it has been discussed and they are being Sold for Breeding.